Here is my first episode, of what I expect to be many, documenting the ins and outs of what it takes to get my insurance company to pay for my weight-loss surgery. Each insurance company has it's own requirements. I can only provide my experiences with United Health Care (UHC) but hope to provide enough information that it can help others with whatever carrier they are dealing with. I am fortunate to have a friend guiding me through the process who has experience with UHC and meeting the qualifications for receiving pre-approval for the procedure. This is the documentation my friend provided me from UHC about the requirements. Something almost all insurance companies are going to require is a history of documented attempts to reduce weight. 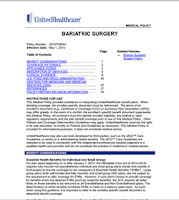 For UHC, the documentation that was provided and successfully submitted by another person resembled the following example to the right. 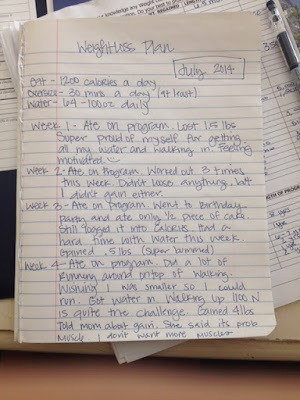 I have a very detailed history of my attempts at weight loss and am in the process of summing it up in a journal such as this for submission to my insurance via Rocky Mountain Associated Physicians (RMAP). After submitting all your information to RMAP, I expect to have to call on a regular basis until I receive approval. According to others who have gone through the procedures via RMAP, it will likely take many phone calls to get the approval required from UHC. Another requirement I must meet is a psychological evaluation. Tomorrow I will schedule an appointment with my primary care physician and will ask him for a referral so that I can schedule that out as soon as possible. Sounds like you have a reliable resource. :) I'm super proud of you for documenting this. You have an incredible memory!